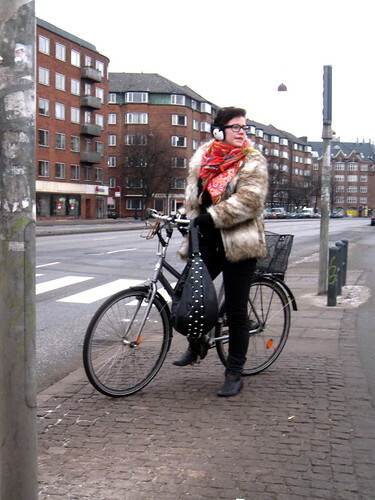 This Copenhagener has it ALL goin' on. Fantastic ensemble. An excellent blog, Rickey enjoys it! Strong work cupcake! What a great subject and I find myself infatuated with this site. Now I'll be checking out the style sense of our commuting cyclists here in Vancouver BC. I wonder how they'll compare? cool blog. greetings from atlanta, ga.
congrats on being today's blog of note by blogger. I think I need to visit Copenhagen to shop for boots. Blogger of note. Couldn't happen to a nicer guy. It's funny how you have different bikes in most pictures!! I don't really know why I find that humorous!! That scarf + fur coast combination just might be the best thing to have ever happened to my eyes. I meant "fur COAT" in my last comment. How do you feel about spandex bicycle shorts with a neon green and yellow stripes? No? Maybe if I added a fur coat? Who knew Copenhagen fashion was so spot on? You have some fantastic photos, thanks for sharing them with us. Sorry to say but she looks funny.. I like her boot. Can you tell me from where she bought it? Just kidding.